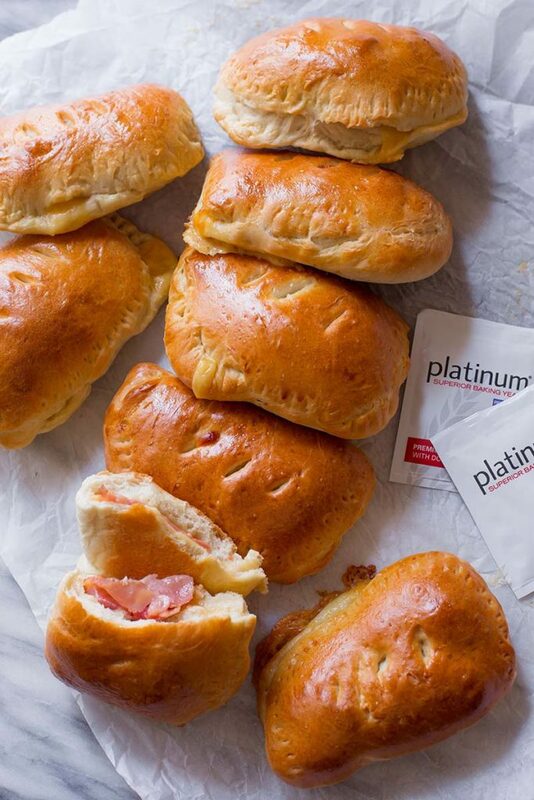 I grew up eating ham and cheese hot pockets. I still love them! These days, I’m much more aware of the processed ingredients inside these frozen snacks, so I began making my own. With real ingredients I could see and taste! The dough is made completely from scratch. But don’t get scared! It’s actually pretty simple. For the best tasting dough, I use Red Star Platinum Yeast– the reason I recommend this yeast? It’s a premium instant yeast, strengthening and improving the quality of dough and the finished volume as well. There’s no reason NOT to use it! Once you have the easy dough made, let it rise for about 1 hour. Then it’s time to shape the dough into pockets. Simply cut into 8 pieces then flatten each into a rectangle and place the ham & cheese on one side. Fold the dough over to fully enclose it, seal the edges, and you’re ready to bake! 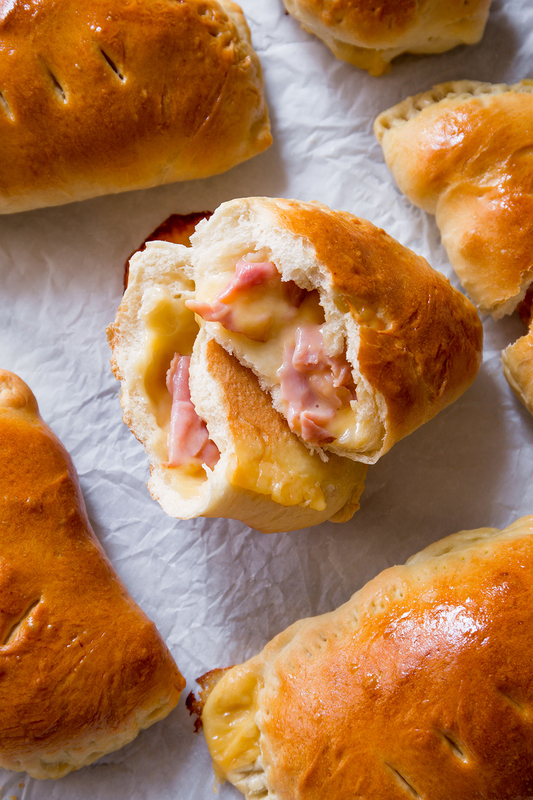 Homemade ham and cheese pockets are downright addicting. Make a couple batches and freeze all the extras for a quick lunch or snack. Just microwave them for about 2-3 minutes and you’ve got a hot and melty homemade snack! Step 1: In a large mixing bowl or the bowl of your stand mixer fitted with a hook attachment, combine the yeast and warm water. Stir it around, then let sit for 5 minutes until the mixture is foamy. Add flour, sugar, olive oil, and salt. Mix by hand or with the dough hook on low speed for 1 minute. Once all of the ingredients are mixed, slowly knead for 7 minutes by hand or with your dough hook on low-medium speed. If your dough is too wet, add up to ¼ cup more flour. 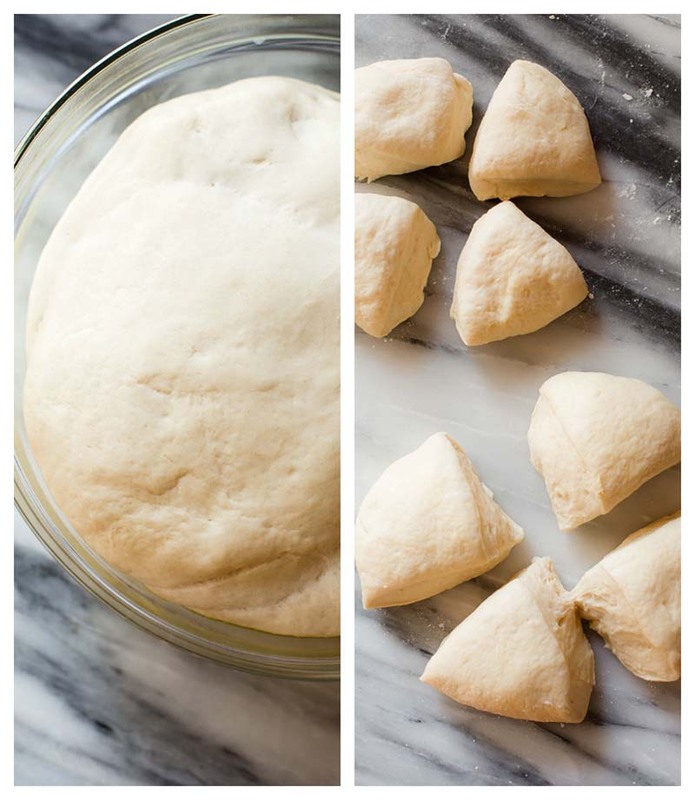 After kneading, your dough should be smooth and elastic. Poke it with your finger – if it slowly bounces back, your dough is ready to rise. If not, keep kneading. Step 2. Shape the dough into a ball and place in a large mixing bowl that has been greased lightly with olive oil. Turn it over to coat all sides. Cover tightly with plastic wrap and allow to rise in a warm environment (about 75°F or 80°F/24°C or 27°C)1 for 1 hour or until doubled in size. Step 3. Preheat oven to 400°F (204°C). Line 2 large baking sheets with parchment paper or silicone baking mats. Step 4. Once risen, punch the dough down to release the air. Turn the dough out onto a lightly floured surface. Using a sharp knife or dough cutter, slice dough in half. Then slice each half into quarters. You’ll have 8 pieces of dough. Flatten each piece with your fingers or use a rolling pin. You want each piece of flattened dough to be about 6 inches long and 4 inches wide. Transfer flattened dough to lined baking sheets. 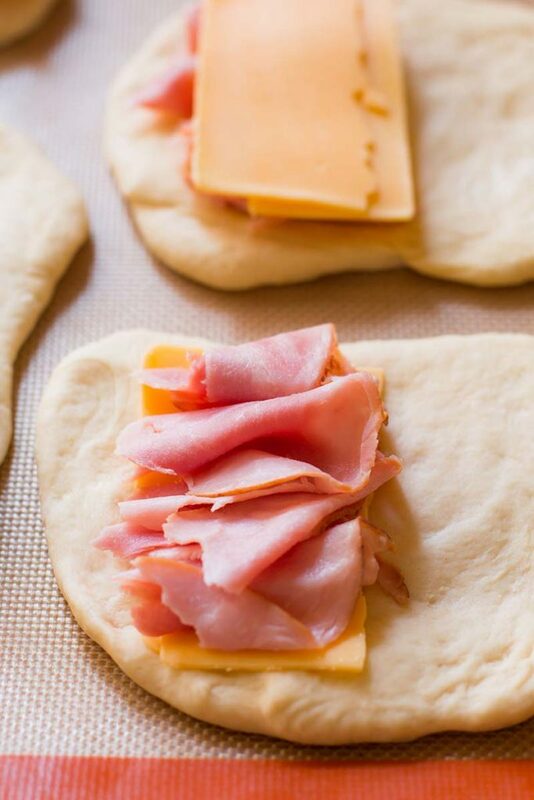 Place the cheese and ham on top of the dough on one side, then fold the other side over top. Pinch the edges to seal as best you can. Use a fork to crimp the edges. Brush the tops and sides of each pocket with egg wash, then slice 2-3 slits in the tops for air vents (use a super sharp knife to do this). Step 5. Bake the pockets for 20-25 minutes, or until the tops are golden brown. Make sure to rotate the baking sheet once or twice during bake time. Remove pockets from the oven and allow to cool on the pan until ready to handle and serve. Make ahead tip: The pockets can be made through step 4, then covered and refrigerated for up to 1 day. Then bake as directed. Freezing: After the pockets cool, wrap them individually in aluminum foil and freeze. Then microwave for 2-3 minutes on high or bake at 350°F (177°C) for 20 minutes. No need to thaw. Yes, click on the ‘Click for a printable version of recipe’ link just below the instructions.